If you took the first part of the tour of the show I've got up at the Belfast Free Library this month, here's one of the pieces we didn't get a chance to talk about yet. 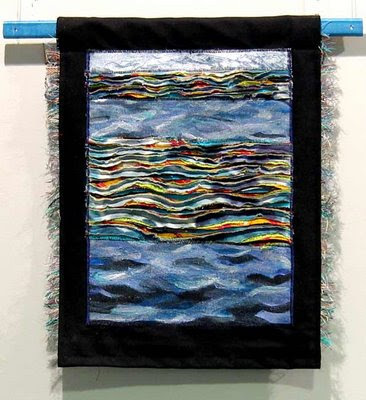 It's another exploration of combining painting and fabric art. The inspiration came from a particularly sweet moment swimming at my favorite pond. I became aware of how light and safe and complete the touch of water is, how effortlessly it floats us. This seemed a close metaphor for the gentle power of the 'still, small voice' of spiritual support. So trustworthy. Also, visually, I'm endlessly fascinated by how water reflects and refracts all the colors around it, and simultaneously shows its own cumulative blues with such extreme contrasts of light and dark so smoothly connected--great visual contrast in harmony, always new. And I love the depth and variety of movement. Such a challenge to respond to in a static medium. Here's how it was made. The painted parts were on a heavy dark denim. I started by blocking out some shapes with tape resist and painting over them with an opaque fabric paint medium mixed with a little pure pigment. Later I added many layers of transparent fabric paint, acrylics, hand-mixed pearlescent pigments and even some glitter. Some of the layers were scored with a palette knife or other things (including a comb!) to scratch through to layers below. The unpainted cloth parts were made by adapting a chenille technique. 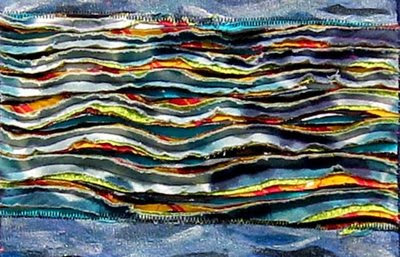 There are seven stacked layers of different fabrics, sewed in wavy rows that decrease in interval (to give a sense of 3-D perspective). They are cut away in the channels between the sewing to different degrees and different levels with a chenille cutter and small scissors, and then ruffled up to different degrees too. I think this works to give a feeling of movement and variety and depth. The fringe on the sides was made with antique silk threads I was given by a friend whose mother had been an avid seamstress. They are in beautiful, luminous colors, too delicate now to sew with for most things. I chose colors to echo and unify the other parts, and to give that feeling of how light and dissolving water is. I thought of the alternate title, Water With a Haircut, with a giggle, as I was trimming the fringe. For me, this completed the communication of the piece; I experience that vast, loving support as including humor...where would we be without that?